Erie #2602 L-1 Camelback Angus class (0-8-8-0) Steam Locomotive. This is my version of the truly bizarre Erie L-1. Built by ALCO for the Erie in 1907, she was, at the time, the largest locomotive in the world, as well as the only articulated camelbacks ever built. Only three were ever built, I chose to number mine after the last of the three simply because most models I've seen are of the first two. A camelback locomotive is a locomotive which has it's cab located in the middle of the boiler, and it's a design that served a special purpose. Camelback locomotives were designed to burn anthracite coal, which burns longer but cooler than bituminous coal, requiring a larger firebox. So large, in fact, that it restricted the engineer's view around it, requiring the cab to be moved forward. It also meant the fireman was left alone on the back of the locomotive. 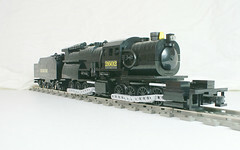 This type of locomotive was eventually banned in the US due to safety concerns. The L-1s were designed for pusher service over the Allegheny Mountains, and served until 1921 when they were refitted with conventional cabs, and retired altogether in 1930. Very nice cammelback you built there. They certaintly are a wierd breed of steam locomotive. You did a good job recreating this one in Lego. Nice job! As a train guru, I can say that that is truly amazing. You captured it well! Und wieso ist dein unterschrift Staatseigentum? Thanks much! She certainly is an ugly duckling. Thanks! I like to pick the oddballs, being a bit of an oddball myself. It's old commentary I've not had the time nor desire to change. Thanks! I had a lot of fun building her.